This timeless classic will have people wanting more. Enjoy as an indulgent treat with a large glass of revered Pouilly-Fumé to complement Coquilles Saint Jacques à la Parisienne. Boil potatoes until tender, drain and return to the pan to dry over a cool heat. Mash with the butter and nutmeg, salt and pepper. Beat until fluffy. Beat in the egg yolks to thicken. Allow to cool, then pipe into the Scallop Shells, around the edge, leaving the middle clear. Heat the fish stock and wine in a pan, add the Rye Bay Scallops, cover and poach for two minutes until the Scallops start to colour. Transfer into a bowl, and save the stock. Cook the button mushrooms in the lemon juice, salt & pepper, and a splash of water, until tender. Cook until all liquid is evaporated. Add the Rye Bay Scallops. Reduced the stock saved earlier until you have approximately 450ml. Fry the shallots in butter until soft (but not coloured), stir in the flour, and whisk in the stock, simmer until the sauce thickens enough to coat the back of a spoon. Add the crème fraiche and simmer. Heat the oven to 200°C. 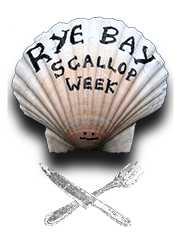 Stir the Rye Bay Scallops into the sauce, then spoon into the shells. Hollow out the centre of the sliced bread to hold the shells in place on a baking tray. Bake until sauce is bubbling and the potatoes brown (approximately 12 minutes). Remove the bread, serve on a plate with side salad to garnish and warm crusty bread.